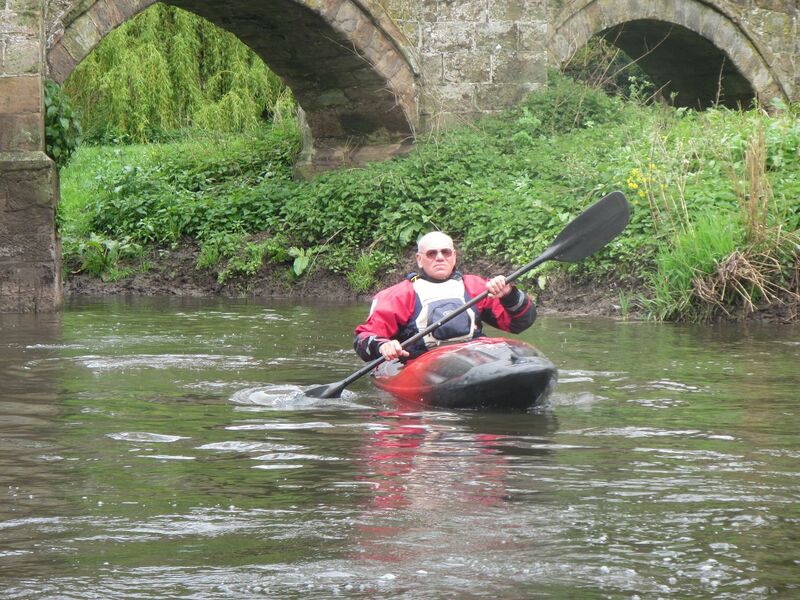 I had decided that it would be a good idea to try to paddle more stretches of water that are new to me this year. 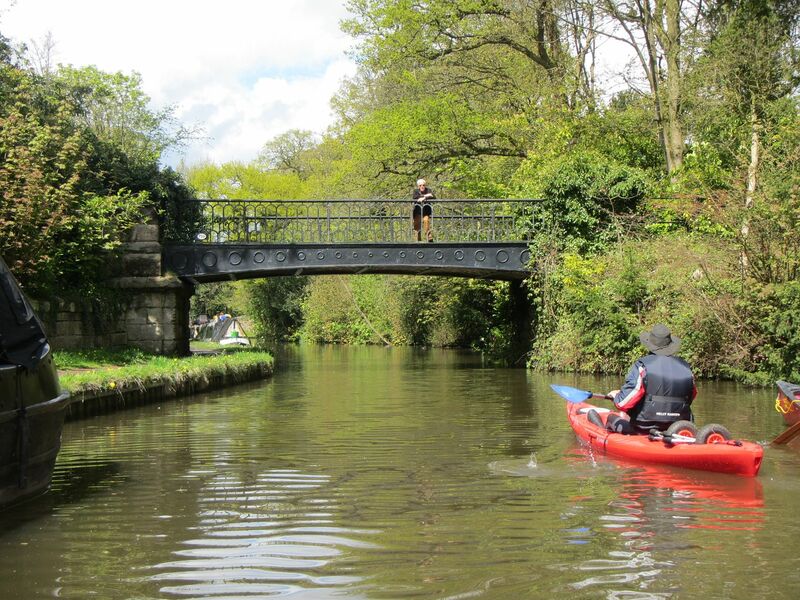 Consequently, when John (Per) posted a prospective trip on the Trent & Mersey Canal and the upper reaches of the River Trent, I considered it! When I read that it was a loop, with no shuttle-faff, I considered it even more. Then, when Frockhopper and I got back quite early on Saturday evening from our trip to Richmond for the Warriors/London Scottish game, and we had won, such that I didn’t need to spend Sunday sulking and kicking the cat, I actually committed! 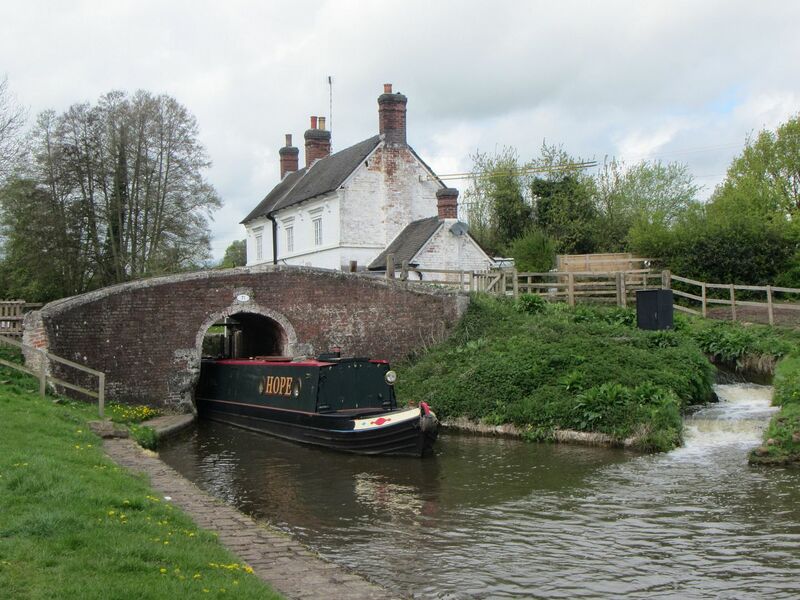 So, early on the morning of Sunday 3rd May, I pressed all the right buttons on English Jane, and she got me to the Canalside Farm Shop and Café in Great Haywood for 9:45. 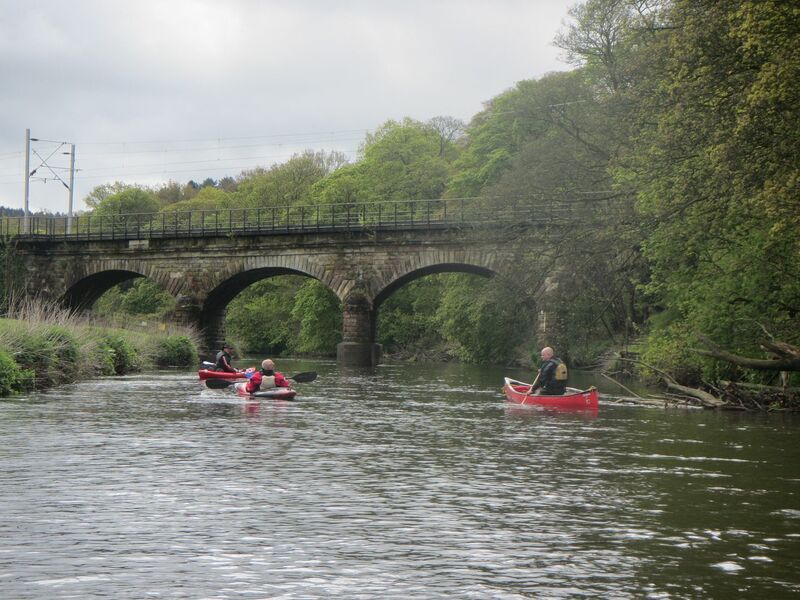 There was one car there already with a kayak on the roof, which belonged to Bob, who is not yet a SotP member, but who found out about the trip from the Potteries Paddlers Facebook page. Our leader, John (Per) arrived a couple of minutes later, and, as we sat in the café enjoying a hot drink, a van arrived with two sit-on-tops strapped to the roof. Steve and Chris (the Longchips) had arrived, and we were quorate. There was some faffing about, but not a lot. Heated debates about the weather we might experience that day led to John and Bob donning their drysuits. 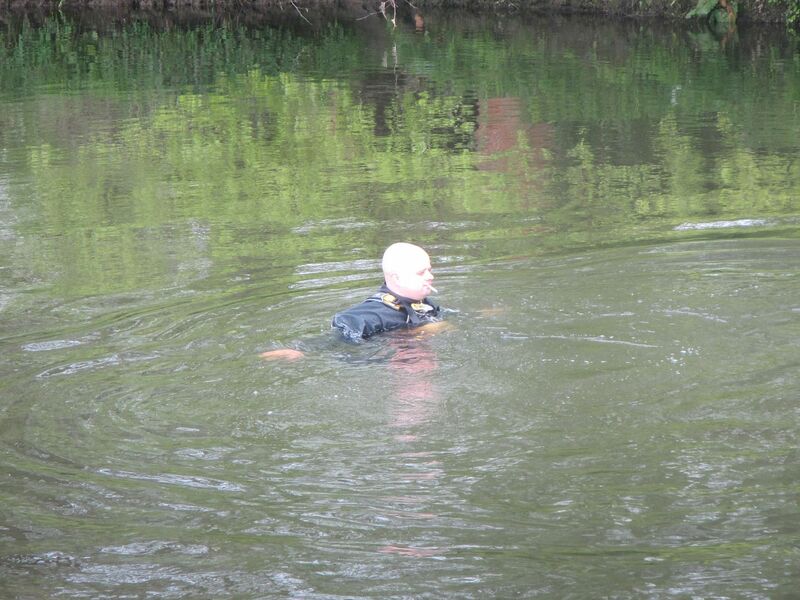 Steve and Chris arrived river-ready, clad in their wetsuits and buoyancy aids. I decided to risk it, wearing my dry suit trousers and a t-shirt. The get-on at Canalside is – unsurprisingly – very close! We were soon on the water and underway. 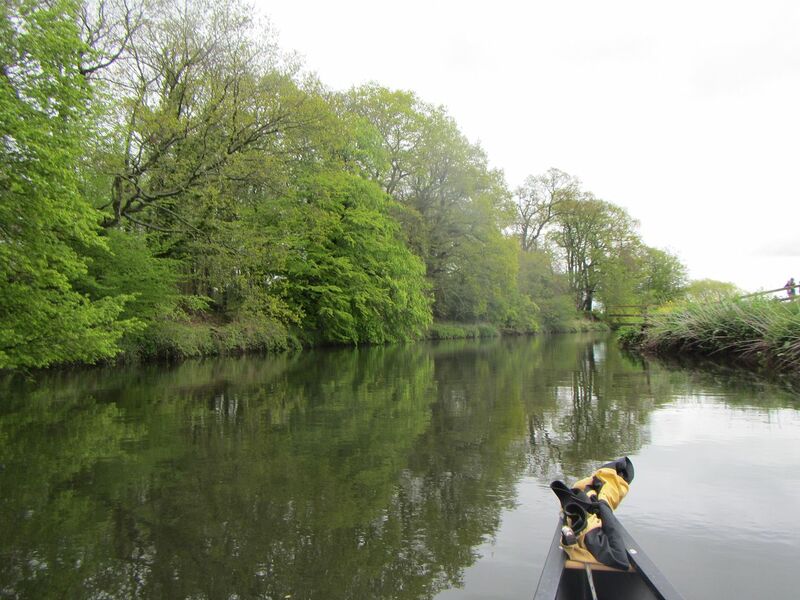 We passed the junction of the Staffs & Worcester canal with the Trent & Mersey. 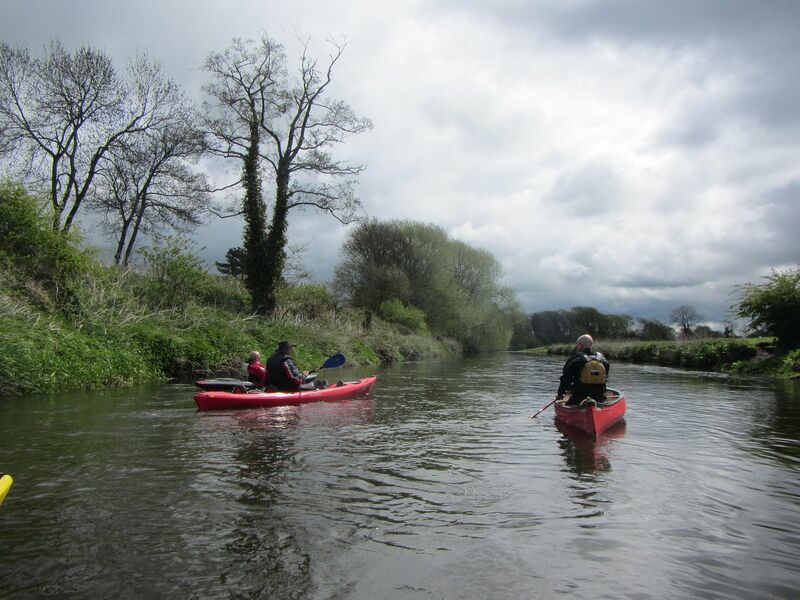 John pointed out that there is another loop available by paddling up the Staffs-Worcs and then dropping onto the River Sow, which brings you back to within half a mile of the Canalside. A couple of hundred yards further on we were off the canal at a lock, and a short walk brought us to the River Trent. 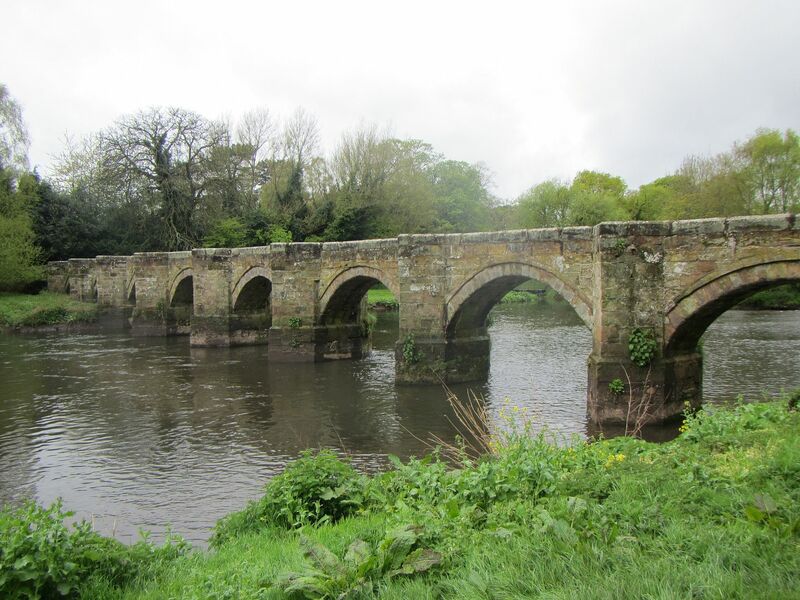 It looked lovely, as did the bridge that crossed it. 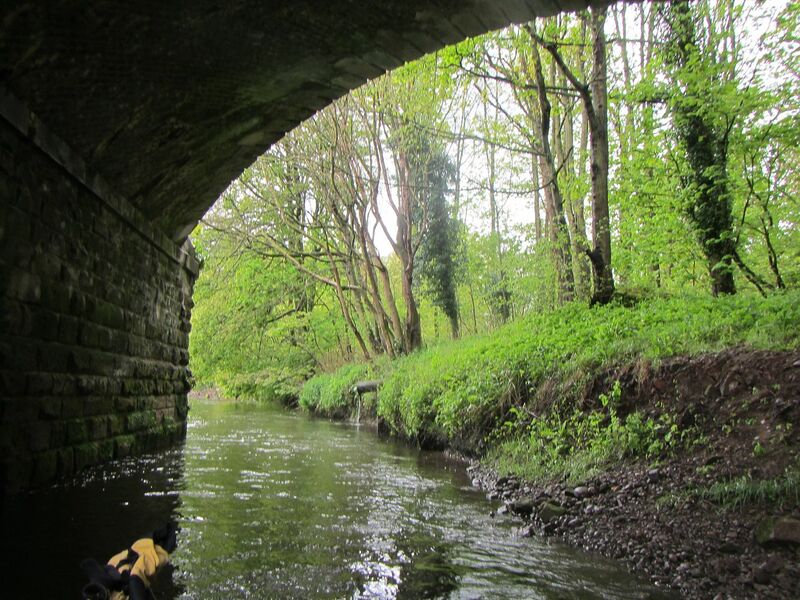 A quick exploration under the bridge showed the confluence of the Sow and the Trent. 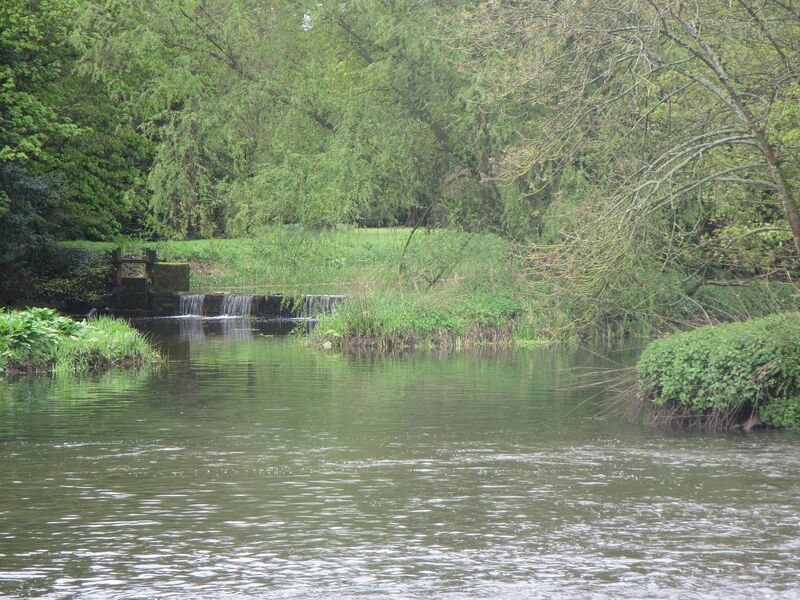 The Sow is the river entering via the vertical weir away on the right bank. 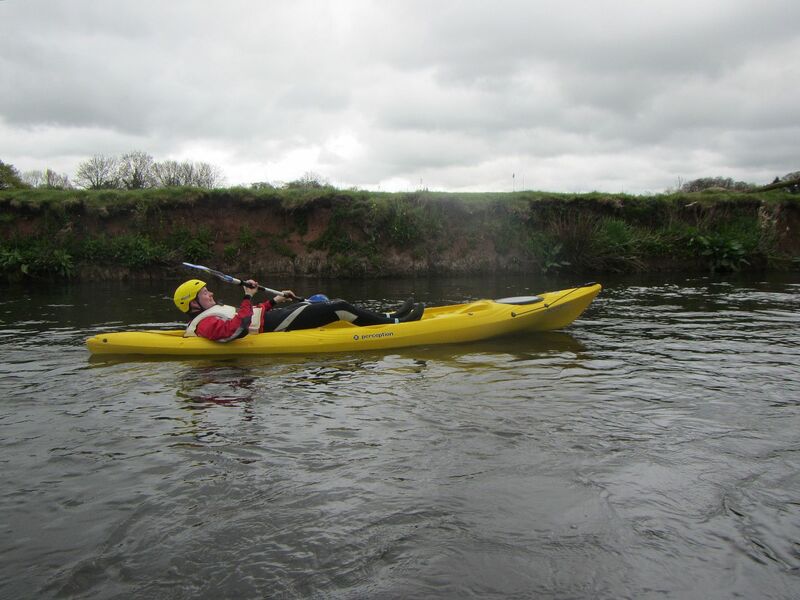 We were soon ready to launch onto the Trent, and John had selflessly tested the depth. What a lovely river it is! Despite some heavy overnight rain, it was low and crystal clear. 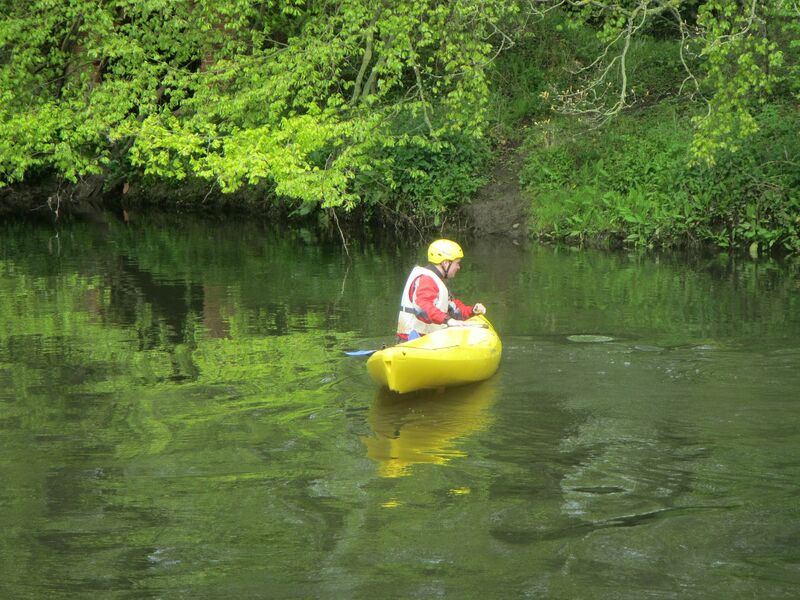 Bob was looking forward to his first white-water experience! We bimbled along chatting and watching the world as we went by it. The river really is a little gem! Some of the world actually watched us go by. Some of the world tried to reach out and grab us, but we were well beyond it’s twiggy grasp. There are, I think, a couple of main railway lines in the area, and we passed beneath the most interesting-looking arch of this bridge. ...Chris decided to keep a low profile. At least, that was his excuse. We reckoned he was just after an excuse for a quick lie down! The yoof of today, eh?! ...it has to be said that it didn't sound very peaceful! There is a shooting range very close by on the right bank, and we heard thousands of gunshots! Either they were very poor shots, or that was one very quick or lucky rabbit! 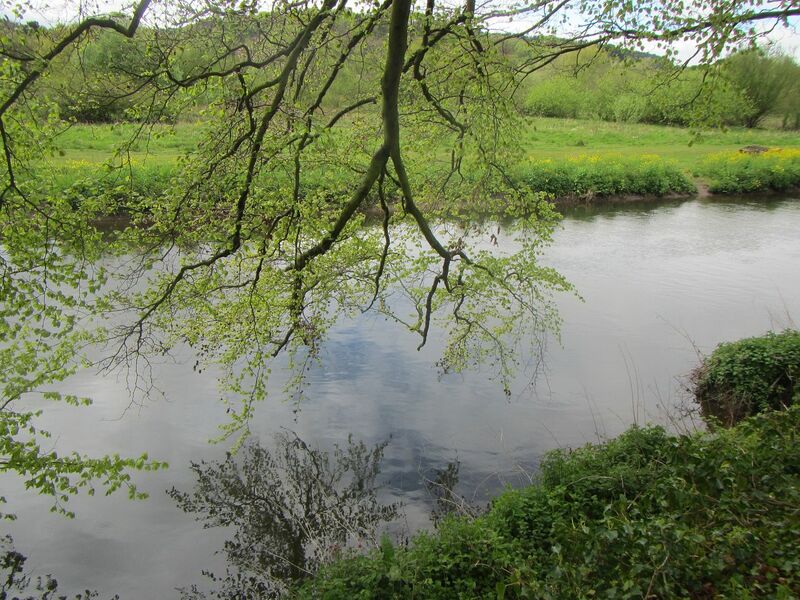 After three miles or so, the river straightened and deepened as it swung once more to run parallel with the canal. This was the cue to get out and to eat the sandwiches we had brought with us… at a very up-market lunch stop! The weather had turned out a lot better than any of us had expected, such that John and Bob were getting quite warm in their dry suits. A cooling-off session was called for. 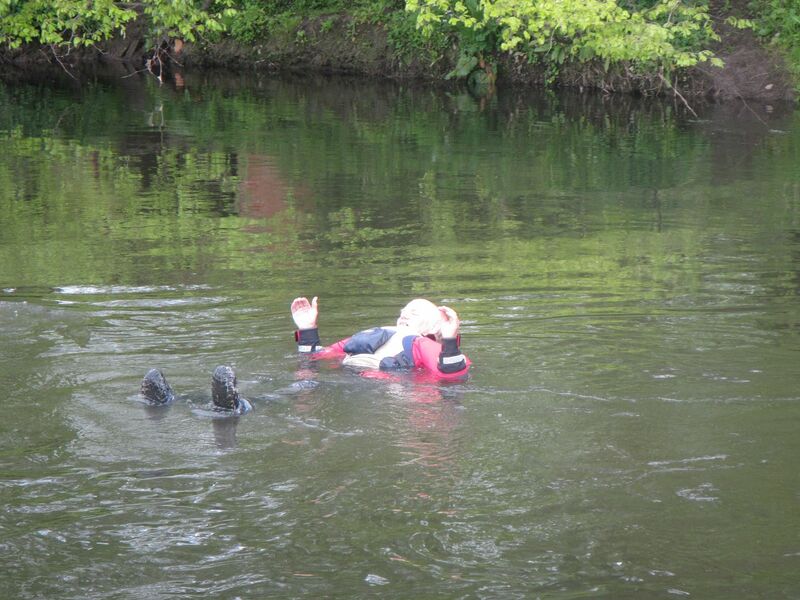 Bob was pleased to report that his – new – dry suit had no leaks! John also took the opportunity to have a quick ciggy, as there were no signs about stating that it is a smoke-free river. 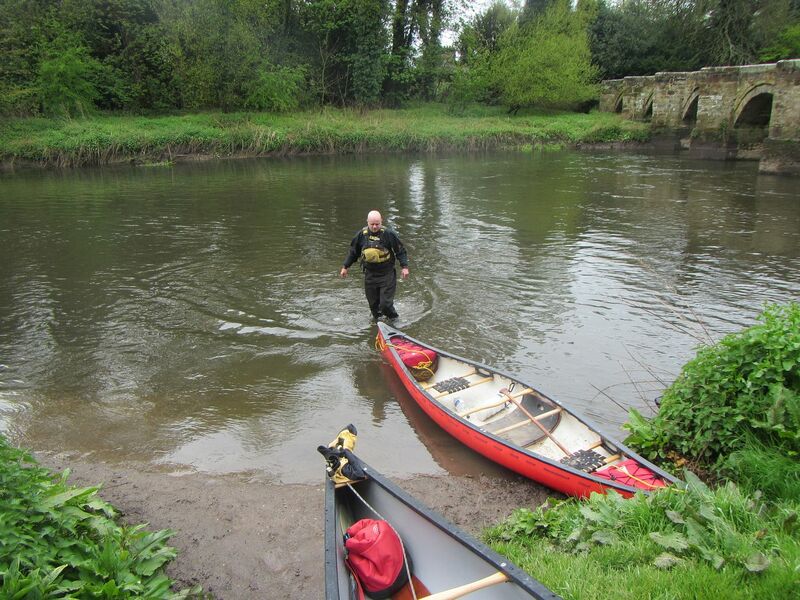 After lunch, John’s route was to cross the river, get off on the other bank and portage the 10 yards or so to the canal! Easy! 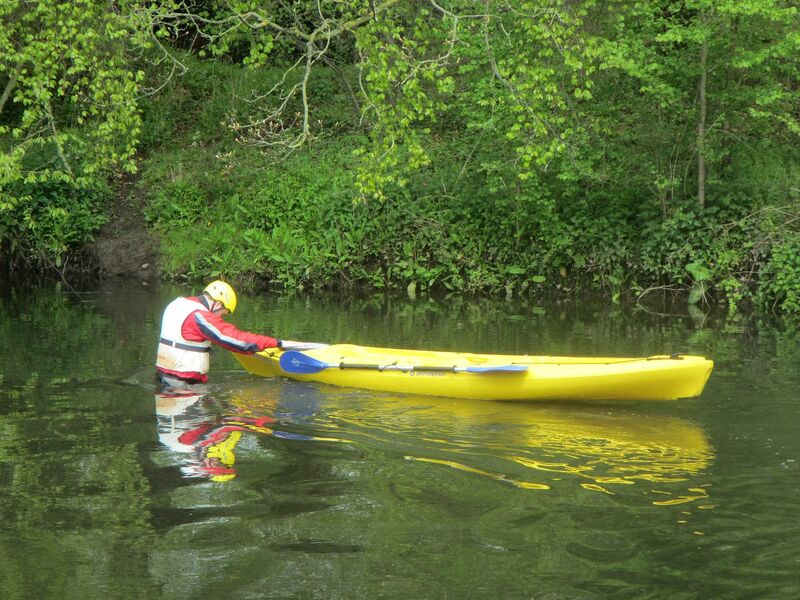 Chris decided he was too tired to paddle all the way across the river, so he walked, taking his boat with him. The yoof of today, eh?! 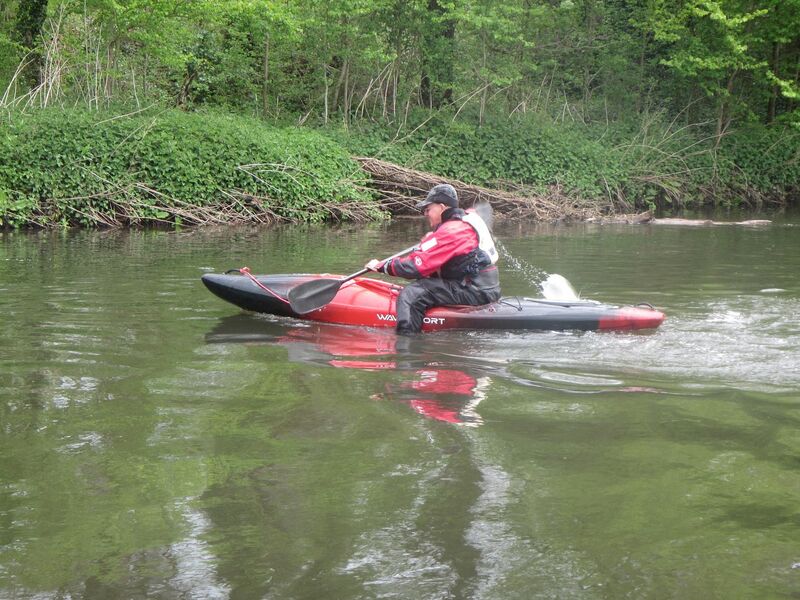 Bob decided he could save time and energy by not stowing his lower limbs away in his kayak, just to have to take them out again a few seconds later. The rest of us crossed in a more traditional and orthodox manner. Whilst we were standing on the canal bank, getting our mojos back, Steve disappeared into a hole beneath the roots of a tree. It reminded me of a book! As we share more than 99% of our DNA with sheep, we followed him down to Middle Earth. What an amazing place, built subterraneously (new word?) between the river and the canal. We wondered what it was. 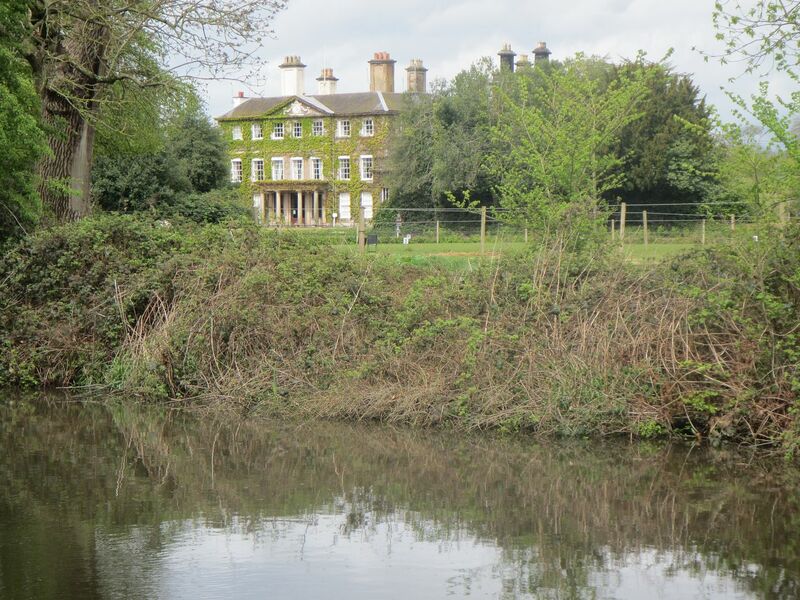 Could it be something to do with this large house, just across the canal. 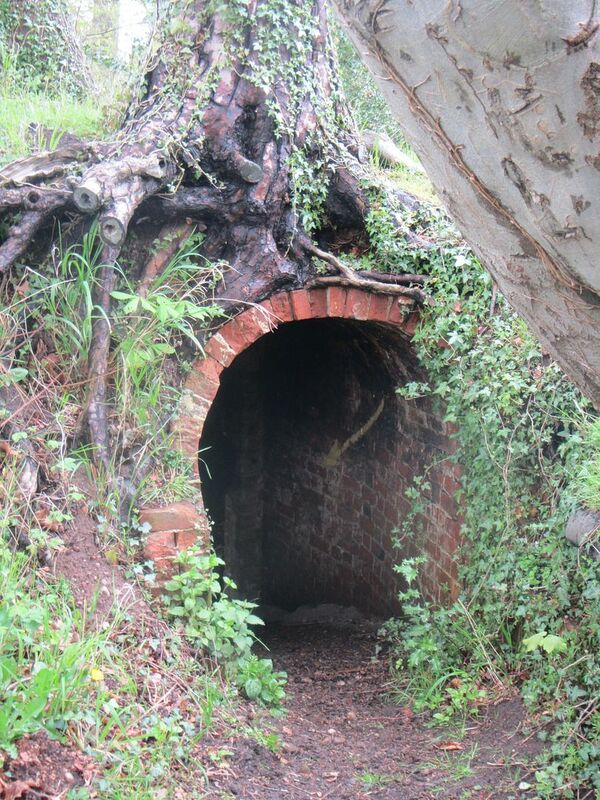 It looked a little like the ice-house at Weston Hall. 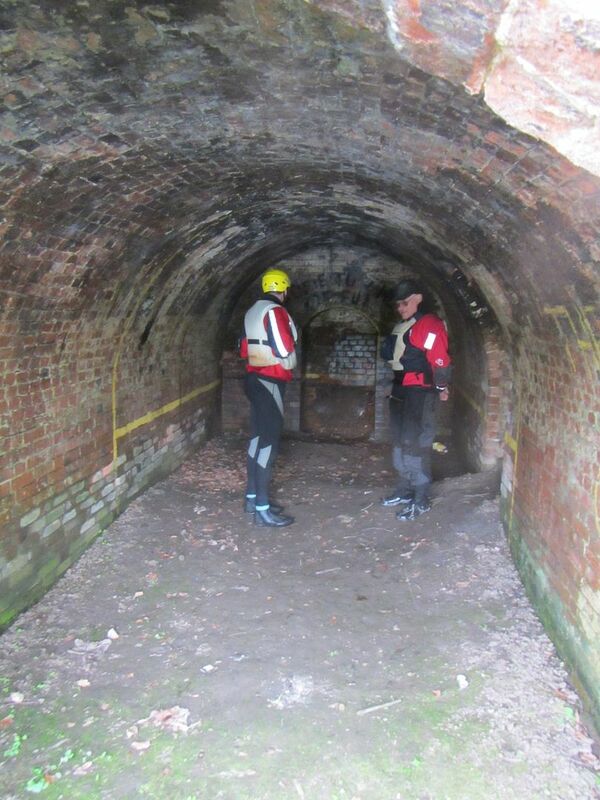 The graffiti on the walls labelled it “the Cave of Fun”, but it was probably built for more mundane purposes. Anyone know? 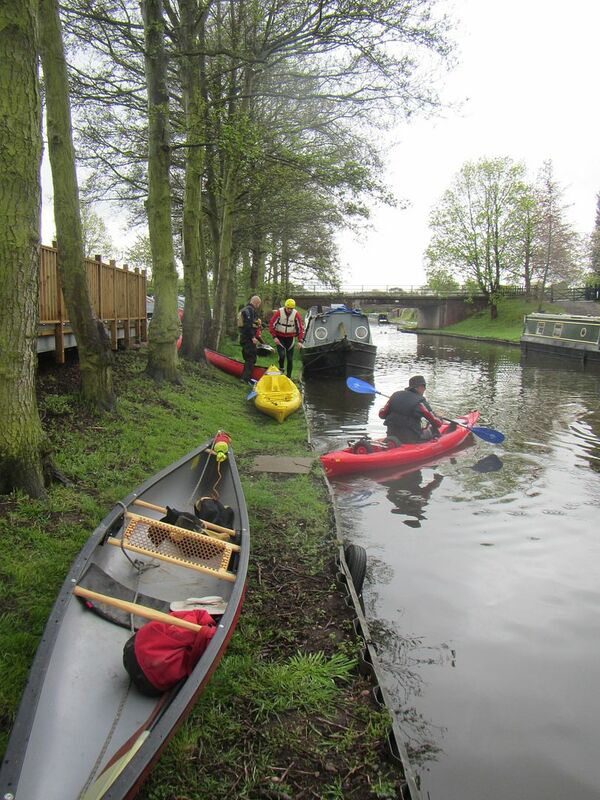 ...and to launch back onto the Canal to make our way back to the cars. John and I swapped boats for about a mile. 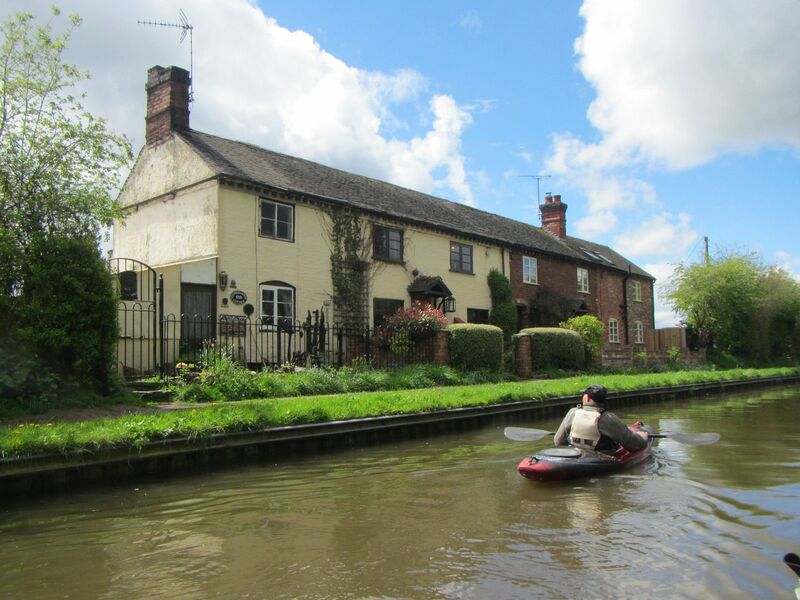 The canal was very interesting, with lambs frolicking on the bank and some lovely old houses. This house had a very strange plant growing in the garden. Can anyone tell us what it is? 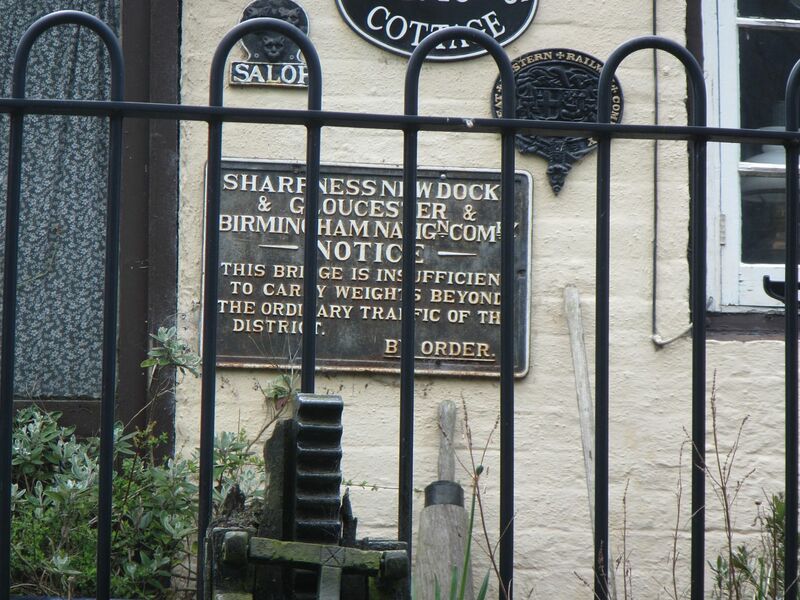 This house had an interesting collection of canal paraphernalia in its front garden and on its walls. 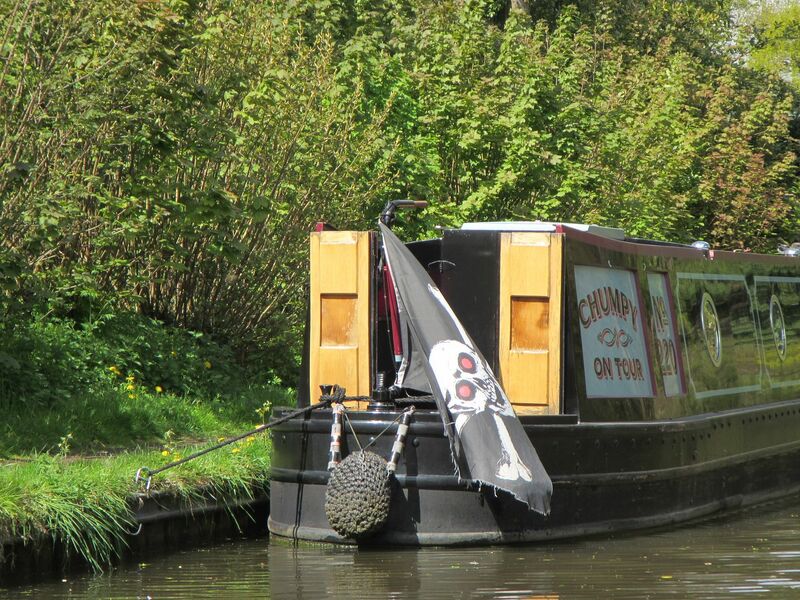 We passed Chumpy the red-eyed pirate, who was evidently having a quick rest from his tour. 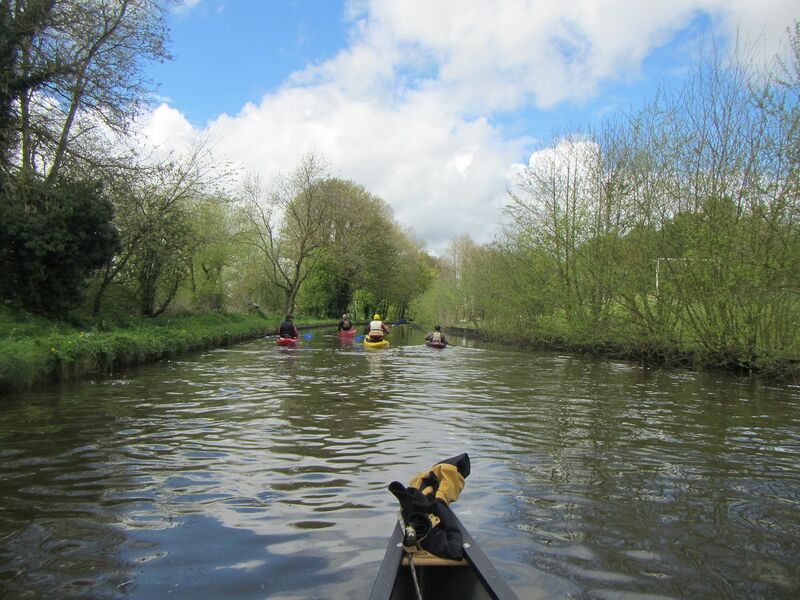 Although we did have the wind against us for some of the journey back along the canal, it wasn’t too bad, and we made good time, especially when chasing a heron down the canal. We thought it must have been one of Mal’s as it would let us approach quite close. This suspicion was confirmed when it refused to pose for photographs. Mal’s obviously got it well nailed down with an exclusive contract! 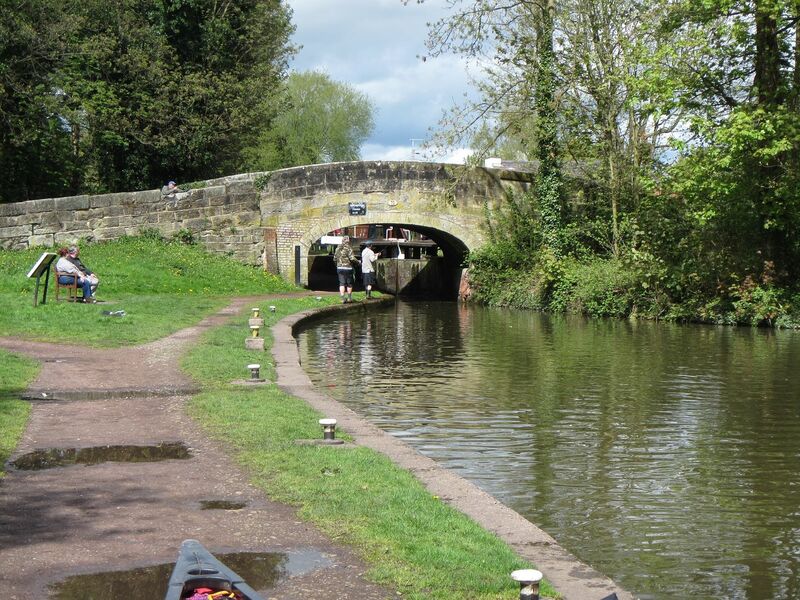 We were soon back at the Canalside, just beyond this bridge and lock. 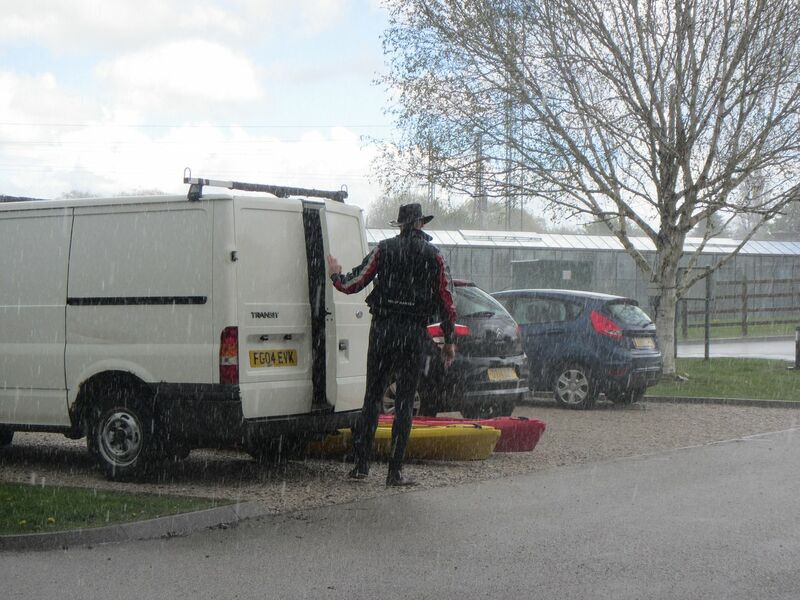 It had been a great day weather-wise, although there was a spot or two of rain as we loaded the cars up. 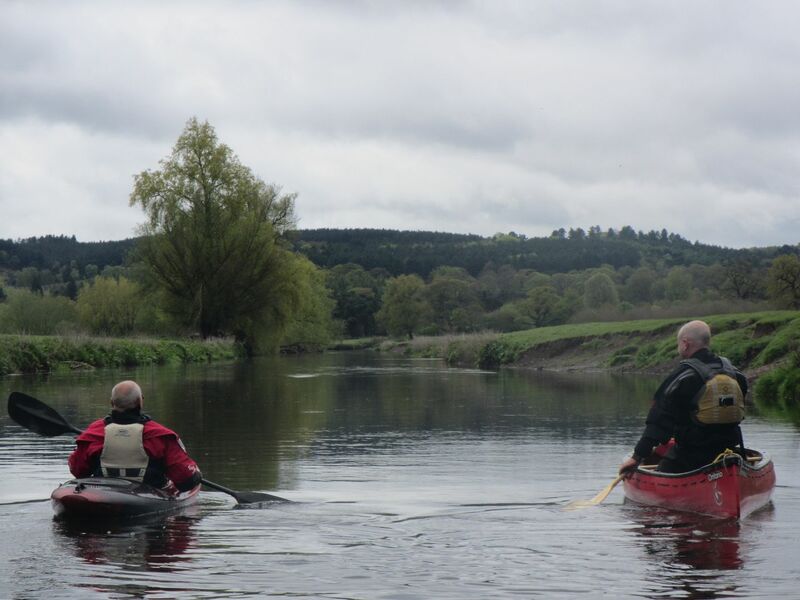 This was a great little paddle in great company. Many thanks to John for organising it and to Steve Chris and Bob for making it a brilliant day. 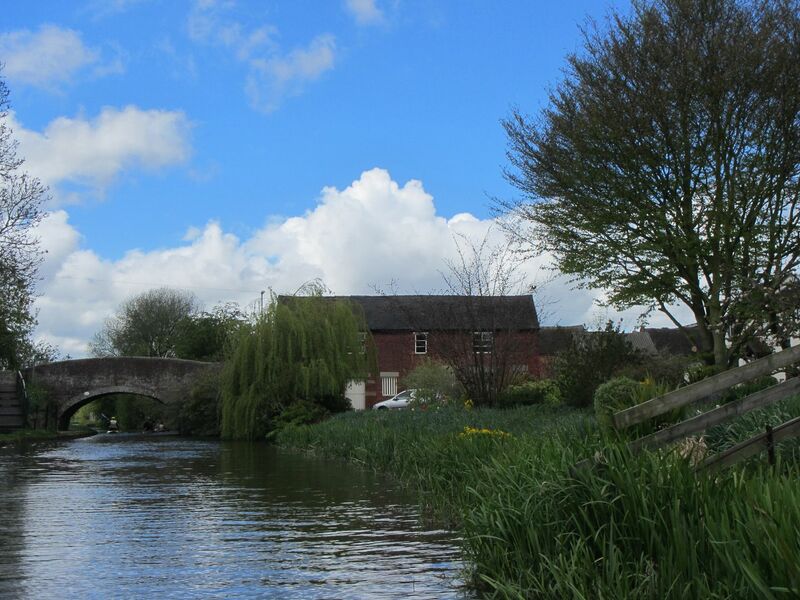 Oh, and the Canalside Farm Shop and Café is cracking place! It costs £1 to park there all day, but it's free if you spend £5 or more in the Farm Shop! Sorry I missed that one ........nice trip and blogg! Lovely bloggage Trev, it looked a great day, pity I was otherwise occupied otherwise I would have been along. 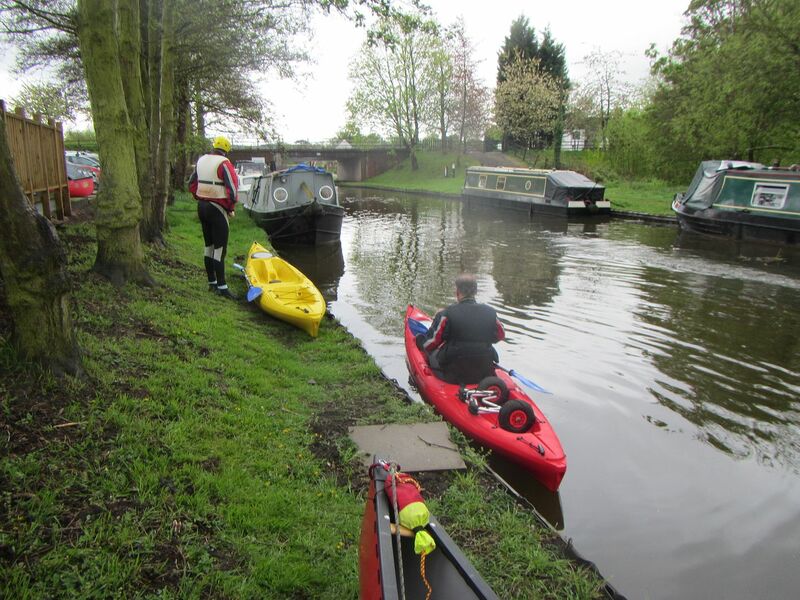 Lots of other opportunities for circuits from Great Heywood if anyone is up for another I'd like to go aways up the Staffs and Worcester canal, beyond Stafford, then return down the Penk and the Sow, ending up in the Trent at Essex Bridge at Great Heywood, you get to tick three rivers in one trip . 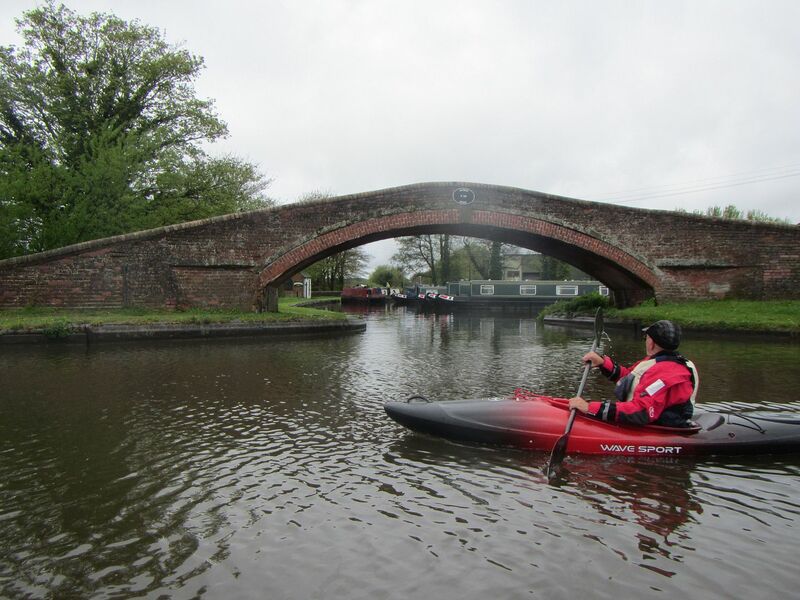 Does anyone on the trip know the grid ref for the cross over you used from the river back into the canal? 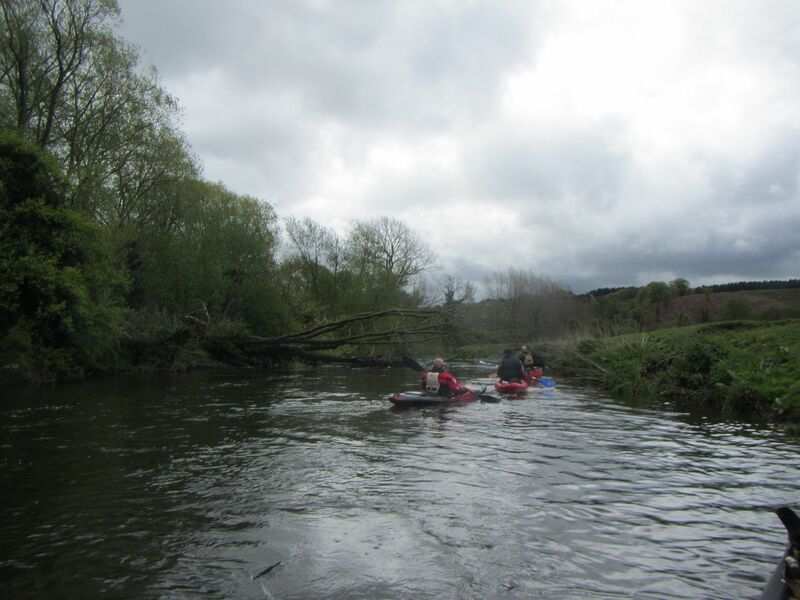 That's one of my local (ish) rivers, a lovely windy little river. From that farm shop there are three day paddles, all loops so you can choose which one on the day. 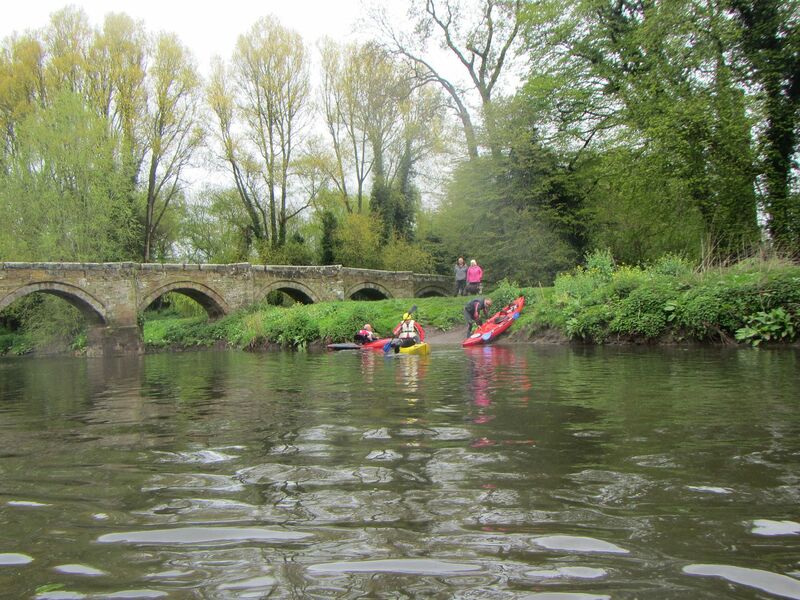 Does anyone on the trip know the grid ref for the cross over you used from the river back into the canal? Last edited by tim; 5th-May-2015 at 05:28 PM. It was by Swan Lake, and I think that the big house opposite is Bishton Hall, now a private prep school. Great blogg. The plant is a Gunnerer. Coaching, leading and supporting Paddlesport. Great half-day bimble and great company. I'm a bit concerned about the mixing of different types of boats shown here. Not the kind of thing we should be encouraging. Haven't we had stern letters about these worrying issues before? 'Nother nice blog. Two in a row! "Great blogg. 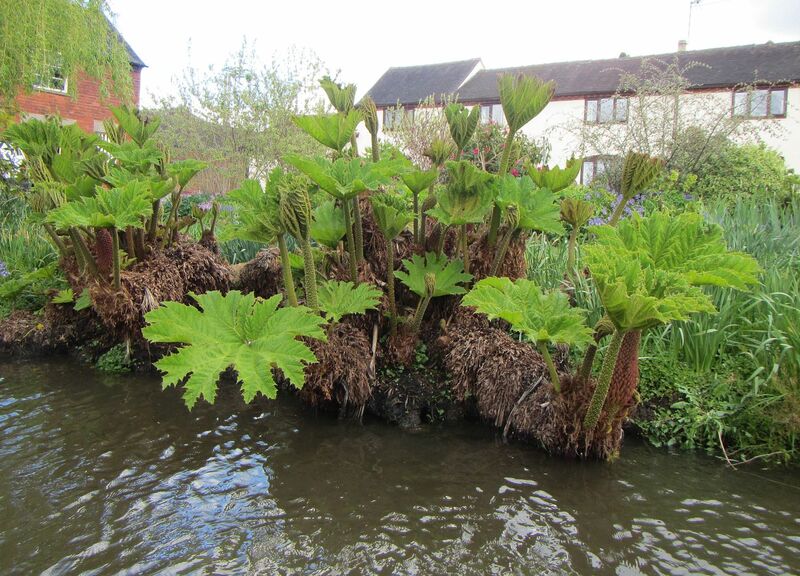 The plant is a Gunnerer"
Correct spelling if you want to buy one is Gunnera manicata aka Giant Rhubarb, will only grow in bogs or waterside conditions. Freshwater environments are often very low in Nitrate plant foods so water plants have developed at least 2 ways round the problem. Eating animals:- fly traps, pitcher plants, sundews etc. Wish I'd been able to join you, looks like an excellent loop. Another nice blog Trev, and one of my favourite loops. 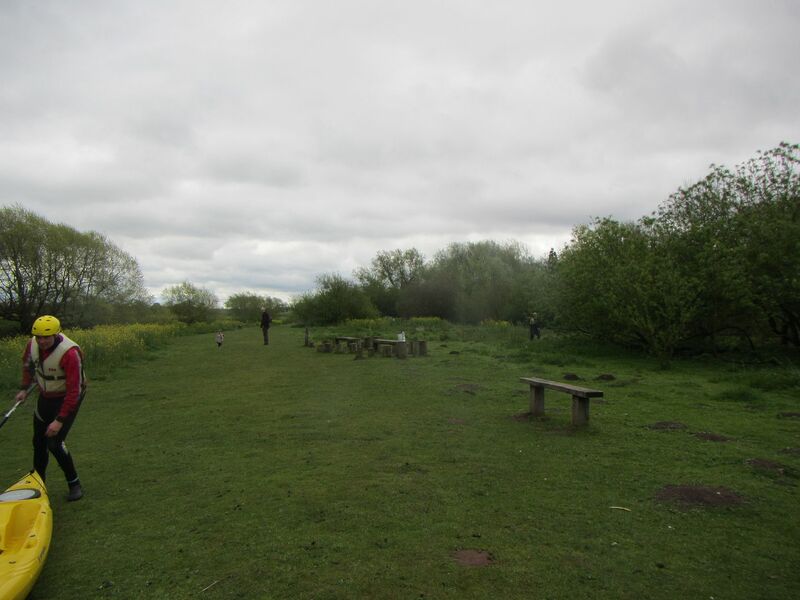 I usually go a bit further down the Trent to the aqueduct and cross the corner of a field to the canal - just a barbed wire fence to carefully get over. 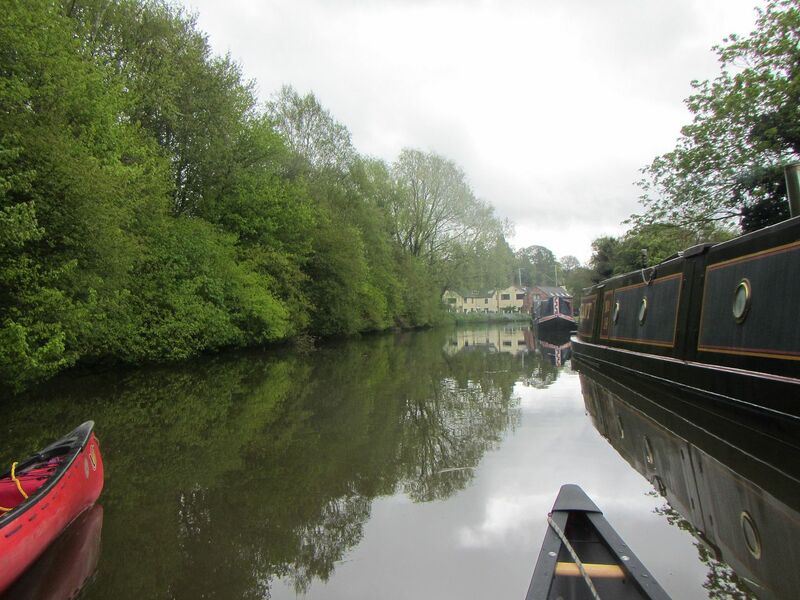 It's a very pretty section of canal. The rest, of course, was brilliant! Heard briefly on the radio today, whilst dodging traffic cones & debris, about the Anderton boat lift that connects the...(the bit that I missed!) 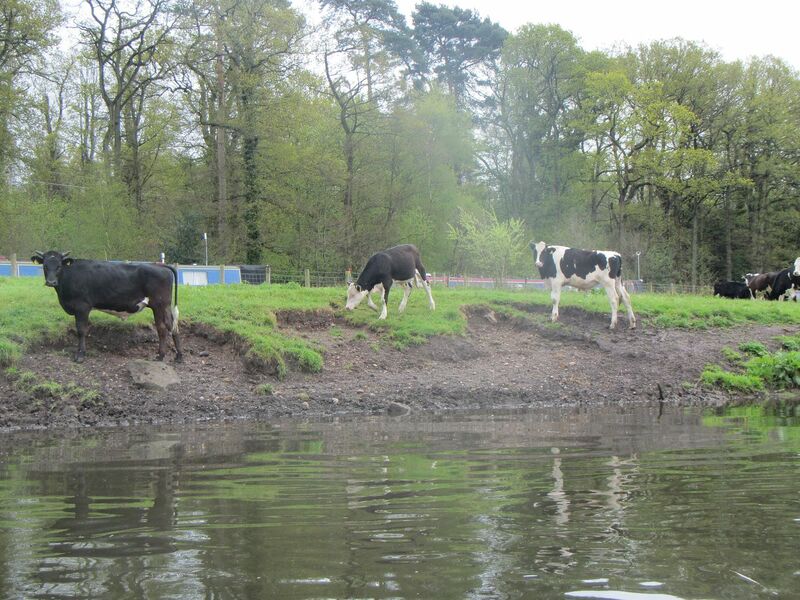 to the Trent & Mersey Canal....But, what I heard did sound good! How many canoes can we get in that lift, and are we allowed to sit in them as it does its stuff? I've done the Cat & Mouse ride at Blackpool, and I've done the Log Ride at Thorpe Park with the family in tow.....and in a previous life, throwm myself out of American aeroplanes and swam upwards from helidunkers & submarine escape towers just to help put some bread on the table! But, I ain't yet done that Anderton boat lift! Last edited by Bonarmbj; 7th-May-2015 at 01:49 AM. Just checked out that boat lift on Google...Wow! 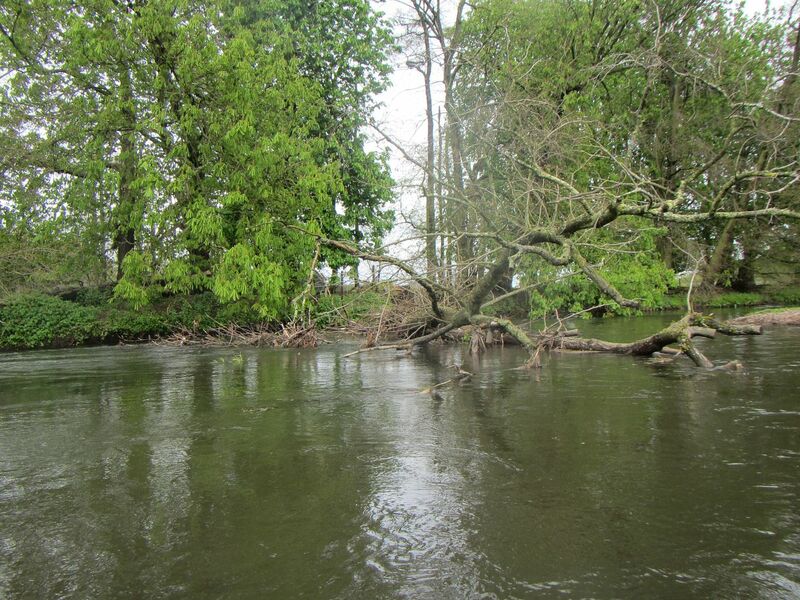 ...a location that looks very close Nikki Nu & Dris...and that bloke (Lord Sutchy) that threw my best camo hat into the fire at The Bala Big Meet 2014! Sometimes you just gotta' roll with the punches! Excellent choice of song for under bridges. I'm glad it's starting to catch on, although not quite an epidemic yet. Perhaps if we do a duet at the Big Meet, it might go viral. Great blog too by the way. 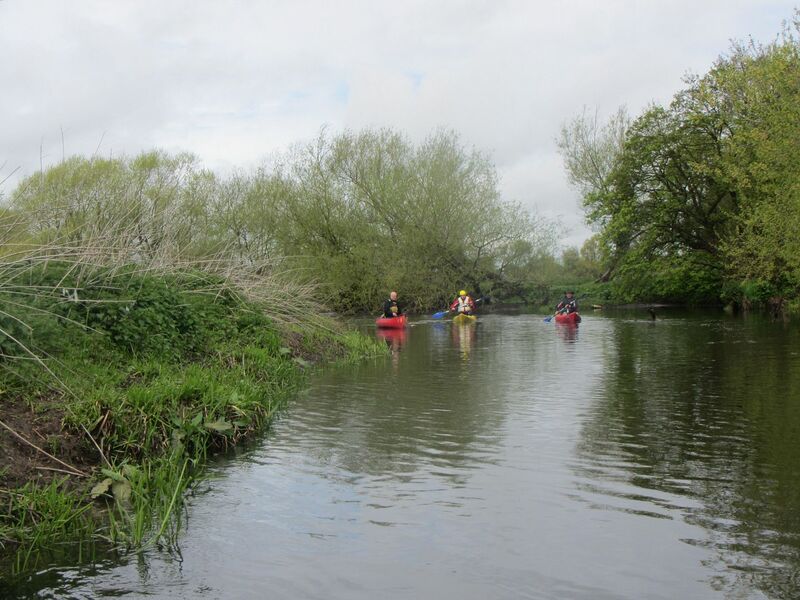 Lovely photos of the boys messin about on the river. And I'm always a sucker for literary references. Frockhopper sounds like a character in Moomintroll. One of my favourite books. Does she mind the name? Does she like it? Oops... I did that reply on my phone. Then, when Frockhopper and I got back quite early on Saturday evening from our trip to Richmond for the Warriors/London Scottish game, and we had won, such that I didn’t need to spend Sunday sulking and kicking the cat, I actually committed! I've never read Moomintroll, which could be one of the drawbacks of grammar school education! We were forced to read Dickens and Shakespeare and soppy romantic poets! I coined the 'Frockhopper' monicker some time ago when I wanted a female version of Rockhopper, as I could never remember how too spell SWMBO. I think she prefers Frockhopper as she reckons I never carry out the 'O' bit of SWMBO.